A collection of quirky, happy characters who, once printed, are roughly 4.5 x 5cms in size. 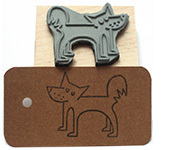 Assembled by hand, the rubber stamp sits on a foam layer which is then stuck onto a block of smooth, natural wood. You can choose to varnish the block or leave it smooth for a more natural feel. Print them onto your own cards, stationery, letterheads, envelopes etc. Purchase a Fishink Notebook and customise your own pad or jotter as they're ideal for notes or friendly reminders too. All stamps are produced in the UK. Price: £4.50 each or Pick and Mix 3 for £12. See below for Pick and Mix details. 1. Pick and Mix 3 stamps by clicking the orange 'Add to Cart' button below. 2. Then select the 'Pick and Mix £0.00' option from the drop-down menu under each of your 3 selected stamps. 3. Click the blue 'ADD TO CART' button next to that stamp.